Slide a '/i-inch-diameter bolt through each of the support straps, slip on a washer, and fit the bolts through each of the bushings in the upper frame rail. Secure the bolts in place with a lock washer and two nuts, using a second wrench to hold one of the nuts in place while you tighten the other one. 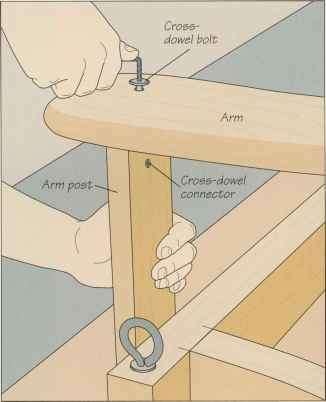 Next, position the bench between the sides of the frame, and repeat the bolting procedure. It will be easier to do this job with a helper to hold the bench in place while you slide the bolts through the bushings in the legs. Tighten the nuts (left).